Thanks to Michelle W and WordPress for this week’s WPC Challenge: Fun. The photo here may show the Heron with what looks like a funny expression, but she was being quite serious at the time. A fisherman was plying the water in her territory that day, and she used this territorial display in an effort to chase him off. Other birds are adept at reading Heron body language, but fishermen? Not so much. That day, the fisherman ignored her threatening pose, which ultimately was lucky for the Heron: at the end of the day, she was rewarded when he tossed a 2-foot long Pike her way. Experimenting with the final look and feel of a photograph using different color tones is a fun method of artistic license. The photos here show the same scene rendered 5 different ways. The top version is an infrared-style B&W. Next, clockwise from top left are Sepia, B&W, Cyanotype, and then Full Color. Which do you like best? How much artistic license is too much? Thanks to Michelle W and WordPress for this week’s WPC Challenge: Fun. And thanks also to Paula for hosting her Black & White Sunday: Favorite. This Great Blue Heron posed between the two subtly different columns has always been a favorite. Thanks to WordPress for today’s Daily Prompt: Muse. This is the Great Blue Heron that did it for me. From July 1 through July 30, 2016, I am the Featured Artist at the Summer Street Gallery. My Great Blue Heron photographs once again grace the walls of the lobby and theater in a free one-woman show at the Summer Street Gallery, of The Center for Arts in Natick. TCAN has a lively, dynamic lineup of upcoming performing artists. Great Blue Heron at the base of the waterfall fishing. Thanks to Ben H and WordPress for this week’s WPC Challenge: Narrow. The Great Blue Heron’s slender neck looks deceptively narrow. Their supple necks allow them to swallow fishes and small mammals of considerable size, and the Heron will slowly turn its heads from side to side to help force their prey down. 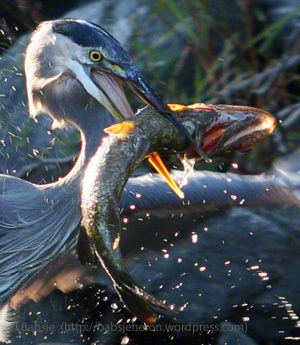 There are several photos elsewhere on this blog showing Herons swallowing huge fish. Great blue heron head-shot in the cove. For the month of March 2016, my Great Blue Heron photographs grace the walls of the lobby and theater in a free one-woman show at the Summer Street Gallery, of The Center for Arts in Natick. TCAN is on FaceBook. To give the gallery a visit, please click here. A selection of my heron and flower photos is now available at the Five Crows Gallery in Natick, MA. Drop in and see the work of the many wonderfully creative artists who show there when you’re in the area. Five Crows is on FaceBook. To give the gallery a visit, please click here.